I don’t know about the rest of you, but I didn’t make it through the whole Super Bowl game where the Seattle Seahawks humiliated the Denver Broncos with a win of 43-8. Not overly fond of either team, I listened to the first quarter as I read a magazine and I watched the second quarter. However, when the Broncos still hadn’t scored a point going into the second half of the game, I decided enough was enough. This was not the be-all-end-all amazing game that football fans all across America wait all year for. This was a complete annihilation and it was sad to watch. 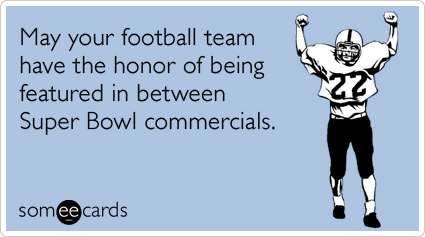 In honor of the most interesting part of the Super Bowl, here is a link to all the great commercials. Plus, the Halftime Show featuring Bruno Mars and the Red Hot Chili Peppers was pretty great too. I think it was by far one of the least controversial halftime shows in years. No nip-slips. No blackouts. No gyrating. And still more entertaining than the game. We went to two parties. The host at the first one scrambled to keep the party going. He had everyone change places to change the mojo. Didn’t work. Dang. Everyone was intent on the commercials which were fantastic! At the second one, no one watched the commercials and the game had become background noise. Thanks for the list! I’ll look them up on YouTube! I didn’t even watch. Not one minute. Seems like I didn’t miss much either! Took in a movie and dinner. So nice and relaxing as no one esle was around. Hey, I’m a New Yorker. We have better things to do! You didn’t miss much, Phil. The game was blah and as much as I enjoyed a few of the commercials, I’ve seen better. Let’s hope next year’s game is a real nail-biter! I’m not a huge Bruno Mars fan, but I did think he put on a good show. A little something there for everyone. In fact, half time is the only part of the super bowl that I sat down and watched in it’s entirety.